BRITAIN’s Jenson Button set the fastest time in second practice for Sunday’s Spanish Grand Prix, the first European race of the season. The winner of the Australian Grand Prix lapped 0.164secs quicker than Bahrain winner and world champion Sebastian Vettel. Fernando Alonso gave the home fans something to cheer about this morning by setting the pace in the first practice session. It was a day where it was difficult to judge who has the ultimate pace around the Circuit de Catalunya. Button admitted afterwards that despite a solid day, he was confused about the tyres here, likely to play a significant role in the outcome of the fifth round of the championship. On his team radio this morning, he complained of terrible understeer and couldn’t get a balance on the hard tyres. Team-mate Lewis Hamilton used the radio to moan about his gear ratios on his way to fourth quickest this afternoon. McLaren have brought a raft of updates to this race, like most of the teams. The most obvious change is a higher nosecone section and neither driver seemed to have issues with what was tried out at the Mugello test last weekend, so this will remain for the crucial qualifying session tomorrow. Red Bull have brought more subtle, if not so obvious updates to their package and it seems like the Milton Keynes team continue to understand what they have underneath them. Vettel had a trouble free day on his way to second place in both sessions and probably carries the small tag of favourite into qualifying tomorrow. Mark Webber had an uneventful day despite take an unscheduled excursion into the turn four gravel trap this afternoon. The Aussie wound up seventh overall and on this evidence, will do well to make it a hat-trick of pole positions at Barcelona. Having spent the first hour of practice sipping cappuccino and getting a baseline of where Ferrari might end up this weekend, a cautious Alonso went fastest this morning, only to slide to a more modest 14th in the afternoon session. Alonso played down expectations in the press conference yesterday and with the quickest Ferrari in FP2 being Felipe Massa in 12th, he has a point. Once again, these two will be amongst a furious scrap for getting into Q3 alongside the Williams and Toro Rosso cars. One of those midfield teams, Sauber had Kamui Kobayashi up in third place this morning whilst Sergio Perez joined Webber with a gravel visit this afternoon at turn four. This is the first race that Sauber are sporting their new marketing partnership with Champions League football finalists Chelsea. The logo of the Stamford Bridge club appears evidently on Sauber’s nosecone. Despite a shocking spelling error on his airbox, Nico Hulkenberg wound up tenth for Force India today, indicating that the young German seems more comfortable than Paul di Resta today. Force India’s spelling might be questioned but the pace of the car seems to be more consistent. Talking of consistent, Lotus look in great shape. Kimi Raikkonen and Romain Grosjean set superb pace on long runs all day and should they qualify well, defintely have to be considered as a serious threat for the race victory, especially if their race pace in Bahrain is anything to go by. However it was a miserable day for Narain Karthikeyan. He sat out FP1 whilst HRT tried out development driver Daniel Cros and in FP2, an electrical problem through turn three meant the Indian driver was forced to stop on track without completing a single laptime of note. Red Bull and Lotus have the slender advantage on race pace but McLaren’s qualifying pace has them in the boxseat for tomorrow at least and Mercedes GP shouldn’t be counted out. 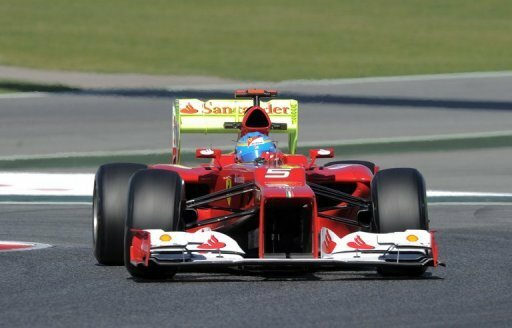 Plus, there could be a Spanish special from the awesome Alonso. It is quite possible that six, maybe even eight drivers have a realistic chance of starting on pole position for the race on Sunday and this means the Spanish Grand Prix is the perfect Sunday lunchtime starter before all that nail-biting last day drama in the Barclays Premier League. Posted on May 11, 2012, in Practice Reports. Bookmark the permalink. 2 Comments. Looks like McLaren remain on 149 though!